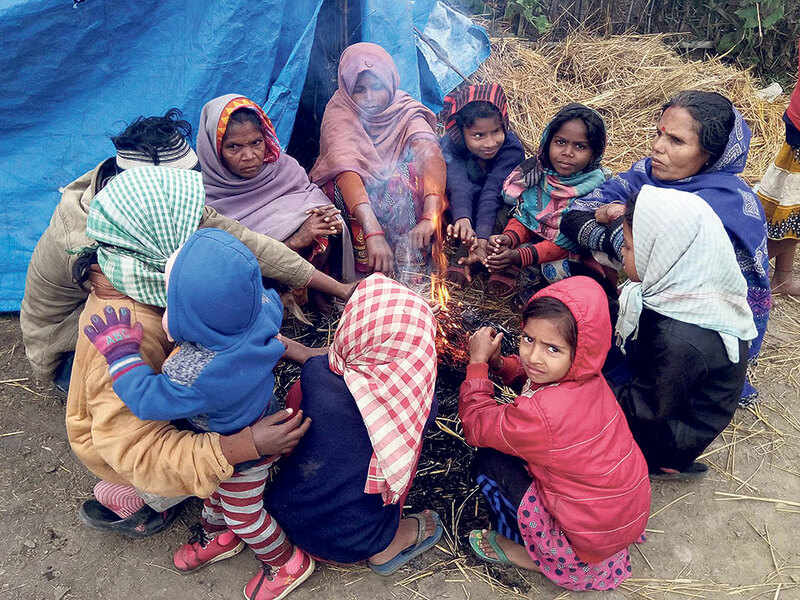 Locals of Saptari sit around fire during winter earlier this week. SAPTARI, Jan 13: Birachhya Malaha, 65, and his wife are already too old to earn for their livelihood. The locals of Mainakadare village of Saptari lost their house, which they had built with their lifetime savings, in the monsoon six months ago. Not only the house but the flood also claimed their cattle and crops, forcing them to live a miserable life at a roadside. Now, the dipping temperature has started taking toll on their health. And the couple has no money to get examined by a doctor. “We cannot afford medical treatment. We don’t even have warm clothes to fend off the cold,” laments Malaha. “It is not the cold which kills people here, it is simply poverty,” he added. After his sons grew up and started to working, the Malaha couple had a relatively easier life for some time. They never had any land of their own before, but with the income of their sons, they were able to buy one katta of land just four years ago. It was there that they had erected a house. “But the flood did not spare the house built with sweat and tears and years of earning. We cannot afford to make it again as it would take another generation,” stated Malaha. “We actually lost our lifetime saving,” he added. Living in a makeshift hut for the last five months has made the couple feel too miserable. Sometimes, the going gets so hard that they simply want to give up. “Sometimes, we simply do not want to live anymore. Even though we work hard, we cannot live a decent life,” lamented Dularadevi, Malaha’s wife. Jiwichha Mukhiya, Malaha’s neighbor, agrees with him. Mukhiya, 65, also lost his house to the flood. His land was also swept away. “My only son works in India. And no matter how hard he toils there, he can save very little,” he said. Mukhiya and his wife run a small tea shop. They earn around Rs 200 per day, which barely suffices for his family. “We work hard but that does not help us fight poverty,” he said. “We have a huge family to feed. Many children to take care of,” he added. Dozens of families, most of them flood victims, are now worried about the chill. In lack of proper house to live in and warm clothes, they are sure to fall sick. They get seriously ill every winter, some of them even succumb to it. According to Mukhiya, lack of doctors and medicines is not just the problem for them. Even paracetamole is not within their reach sometimes. “We are neglected people. Doctors don’t visit our area and we can’t visit them. So, during cold weather, we are always in trouble,” he said. “Our children get no medicine even when they are bed ridden. Condition of elders like us is no different,” he added. According to the data provided by the District Disaster Relief Committee, a total of 130 houses were fully damaged due to the flood. Over 1,000 families in the village had been displaced. And even in so many months, nothing has changed for better. “We are still living life of victims. Once displaced by flood, your fate is changed forever. Because the government does nothing for you and you can never come out of the vicious circle of poverty,” commented Mukhiya. “Sometimes, we wish it would have been better if we had died in the disaster. Dying once is better than dying a bit everyday,” he lamented. Ward member of Trihut Rural Municipality, Jayprakash Yadav, meanwhile stated that a small support package cannot bring huge changes in people’s life. Moreover, only few flood victims have received such relief packages post flood. “If you go to the poor communities, neither do they have food stock, nor any proper source of income. You can imagine their condition,” he said. “Now, in the winter, they of course will die when hit by cold wave. After winter, there is again the troubles of monsoon, which again gives them enough pain. So, the government must do something for permanent solution to such problem,” he added.